County Human Resources Director Raul Silguero speaks during the county commissioners meeting April 10, 2018, in Edinburg. EDINBURG — Hidalgo County commissioners approved Tuesday a compensation plan that will give staff equal pay for equal work across the board, Human Resources Director Raul Silguero said. Commissioners, through Silguero’s efforts, have been actively working for over a year on implementing what is commonly referred to as a step and grade pay system to ensure that a clerk, for example, in one department earns the same pay as their equally qualified counterpart in another. The county previously had a similar compensation guide in place, but it was suspended in 2012 after officials noticed the system allowed administrators to give raises based on criteria more subjective rather than objective in nature, Silguero said. Soon after the policy was suspended, Silguero began working on a new step and grade system that more clearly defined how and when staff should see a raise. “The court wanted me to do this without it costing a great deal of money, and I assured them at the time it wouldn’t,” Silguero said. 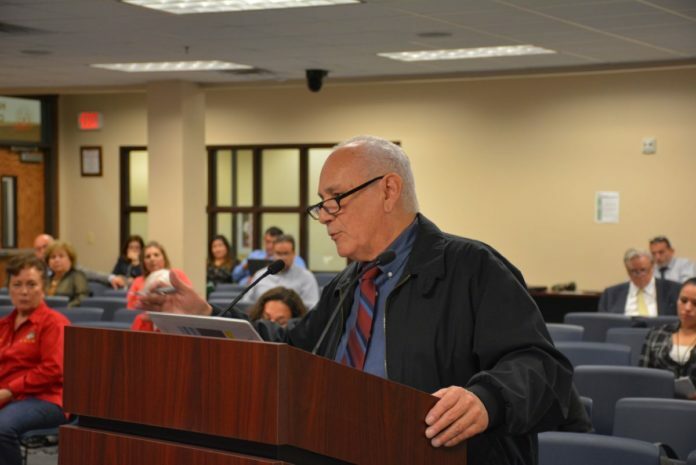 The county implemented the two first phases of the new policy, but stopped at the third phase, which was supposed to address staff at precinct offices, among other departments, Silguero said. Afterward, Silguero left his position in the budget office and began working for then Precinct 2 Commissioner Tito Palacios, leaving the effort in limbo. “So it’s been on hiatus for a few years,”Silguero said. On Tuesday, he presented a new system that categorized nearly 2,000 positions into 21 grades, or levels of responsibility, and outlined 11 steps, or merit-based pay adjustments, that staff can obtain throughout their tenure. Moving from step to step is the equivalent of a 3.5 percent raise, with promotion dependent upon criteria involving an employee’s conduct, longevity and performance, among others, Silguero said. The new pay structure ranges from about $25,000 for entry-level employees with minimal responsibilities to about $129,000 for higher ups, such as department heads, with the highest level of experience and tenure. Implementing the new system actually saved the county about $14,000 from its budget of more than $97 million for salaries, Silguero said. He expects the county to continue seeing cost reductions as employees who have worked their way up the steps begin to retire, reverting the position back to step one, or entry-level. Some departments, such as the district attorney’s office and the health and human services office, will have some flexibility when it comes to deciding at which step an employee begins when hired. Some officials have the ability to start employees at step 4 if the official can justify the move. “For example, a person with a master’s degree and five years of experience could be hired at step two,” Silguero said. The new policy, however, does not apply to all county positions. “There are about 337 positions out of 3,134 that are nonclassified, meaning that their salaries are set in a different manner,” Silguero said. Those positions, such as court reporters and staff at the juvenile office, are overseen by the Hidalgo County Board of Judges, which sets the pay rates as mandated by state law. Implementation of the new policy is pending approval from the Civil Service Commission, which meets April 19. If approved, it will be implemented April 30 with some employees who earned below their respective step 1 pay grade seeing a slight increase in earnings. No one, however, will see a decrease in pay, Silguero said. This story has been updated to reflect the new pay plan will affect nearly 2,000 positions at Hidalgo County.